With coming depreciation and withdraw of Legacy Bluetooth Core Specification Version, BT4.1/BT4.0 has been defined to be withdraw in 1 July, 2020, which covered Nordic’s nRF51 series solution (Raytac MDBT40 series module). The granted BT4.2 DID includes not only basic GATT, RF PHY and Link Layer, but also a completed coverage of BLE software stack: Proximity Profile; Heart Rate Profile; Health Thermometer Profile; Blood Pressure Profile; Running Speed & Cadence Profile; HID Over GATT Profile; Alert Notification Profile; Glucose Profile; Cycling Speed & Cadence Profile ; Mesh Profile which fully support customers to suit the needs of any application! For All customer’s convenience, we would like to list Raytac’s Module Specification Sheet link in below for quick reference. There is a frequent question comes up from people! What is the Bluetooth Power Classes? What is Class 1 and what is Class 2? What the relationship Power Classes related to working range? Here, there is a simple chart can help everyone to have an easy understanding! Now, it is obviously to know why Raytac’s module is superior! Here, we are glad to announce 2016 Raytac Module Family have been all well planned. 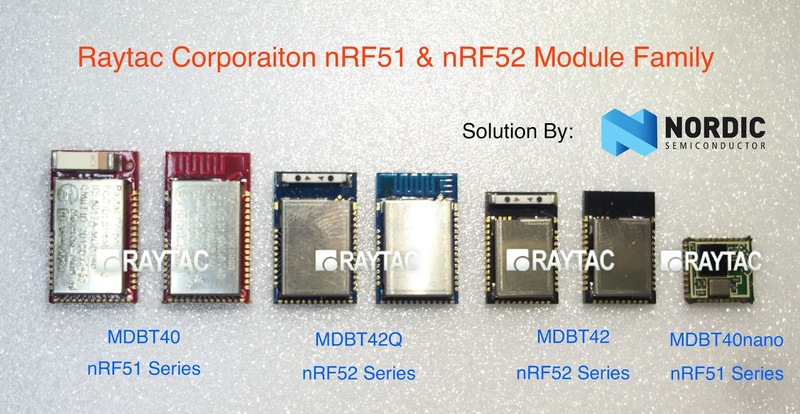 nRF51 series, MDBT40 modules all have been released and have widely implements done in the market. Started from April 2016, Raytac’s MDBT42 engineering sample will be available for customer’s evaluation. According to SIG’s regulation, every brand needs to have unique Declaration ID (also called as DID) for individual product. 1. What needs to happen when a company co-brands with another company? Company A is selling a product that is co-branded with Company B’s brand. Do both companies need to be a member and create a Declaration? Note: In addition, the Bluetooth footnote must be on the product packaging and must show that both companies are licensed to use the Bluetooth trademarks. 2. What needs for white labeling products? White labeling is the practice of rebranding another product with your own brand. For example, Company A manufactures or supplies Bluetooth products, and is marketing and selling these products to different companies (e.g. Company B, C, D). Company A can apply the different company’s brands on the products, or the OEM can apply their own brand on the products after purchasing. What does either company need to do? 3. Updated table of list of Raytac’s Model No. 皆様のご来場を心よりお待ちしております! See you all at IT Week in April 10-12 in Tokyo, Japan!